Make no mistake, I'm a Twins fan. But after watching that crazy World Series game last night ... I gotta root, root, root for my other home team. Holy moly! People think that baseball is boring, but last night's nail-biter was anything but. My palms were sweating as the Dodgers and the Astros traded home runs and strike outs right up until the last pitch of the extra innings game. It was everything you could ever want in a baseball game, and being there must have been crazy. They even brought out Vin Scully and Fernando Valenzuela to kick it all off! Larry King and Mary Hart were right behind home plate. A typically rabid Dodger fan jumped into the Houston bullpen! It was a million degrees at Dodger Stadium. Classic L.A. all. The world itself has been so crazy lately, that these epic sports battles are a welcome distraction - which is, of course, exactly what they were intended to be. Distract the people by making them care DEEPLY (Seriously. Read the comments during live streams of these games. It's some fans' entire lives!) about grown men throwing balls or shooting pucks, and they won't pay attention to the nefarious things the governments are doing behind the scenes. We know this ... and yet it's still absolutely riveting and cannot be helped. I'm rooting for the Dodgers - because, L.A. - but I wouldn't be mad if Houston wins either. They've had a real tough year and I'm sure their first World Series championship ever would make them all a lot happier ... but then, the Dodgers haven't won in 30 years, so that's great too. The truth is, everyone watching this epic battle wins, because it's awesome ball and incredible drama. Last night's game will be talked about for ages, and though the Dodgers ended up losing, they got to play in one of the all time classics. I bet it goes to seven games, and I bet the whole town will be both hoarse and clad in Dodger Blue for the duration. 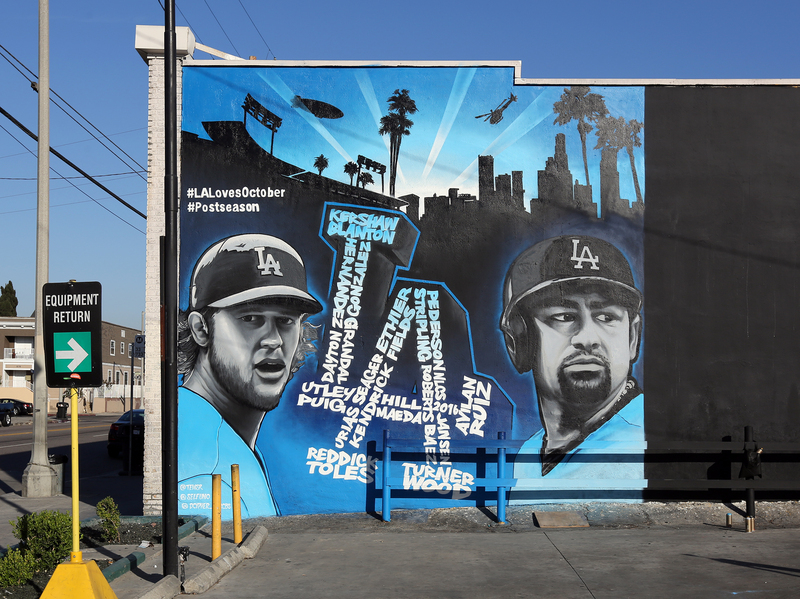 *Mural at 2270 Venice Boulevard.